The Ecologix MBBR is a highly effective biological treatment process based on a combination of conventional activated sludge process and biofilm media. 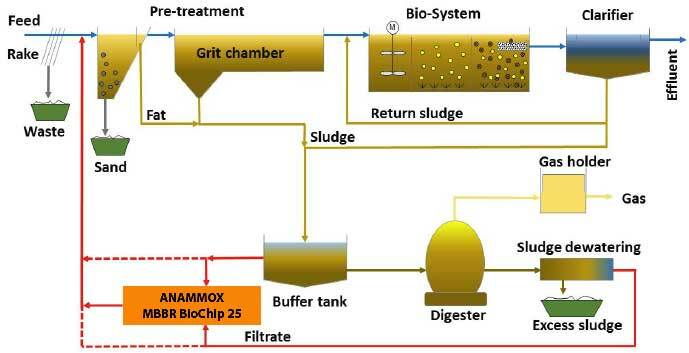 The MBBR process utilizes floating High Capacity MicroOrganism BioChips media within the aeration and anoxic tanks. The microorganisms consume organic material. The media provides increased surface area for the biological microorganisms to attach and grow. The increased surface area reduces the footprint of the tanks required to treat the wastewater. The treatment process can be aerobic and/or anaerobic and operates at high volume loads. The MBBR process utilizes floating plastic carriers (media) within the aeration tank to increase the amount of microorganisms available to treat the wastewater. The microorganisms consume organic material. The media provides increased surface area for the biological microorganisms to attach to and grow in the aeration tanks. The increased surface area reduces the footprint of the tanks required to treat the wastewater. The media is continuously agitated by bubbles from the aeration system that adds oxygen at the bottom of the first compartment of the aeration tank. The microorganisms consume organic material. 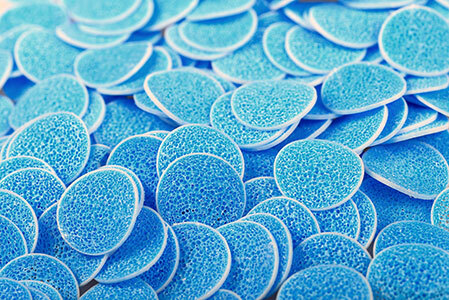 When compared to conventional secondary treatment it provides superior efficiency and value. In fact the MBBR media or biochips utilized exclusively by Ecologix have an active surface area > 4000 m2/m3 which is up to six (6) times greater than any competing media available on the market today. 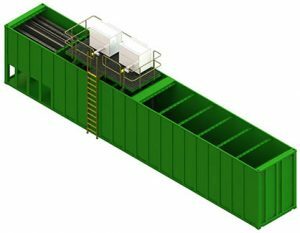 The MBBR is a complete mix, continuous flow through process which is based on the biofilms principle that combines the benefits of both the activated sludge process and conventional fixed film systems without their disadvantages. The MBBR BioChip 30 is a high performance MBBR carrier that provides a protected active surface area of > 5,500 m2/m3 for the immobilization of microorganisms which are in charge of the different biological water treatment processes. This active surface area has been scientifically certified and compares to a range of 350 m2/m3 – 800 m2/m3 provided by competitive solutions. 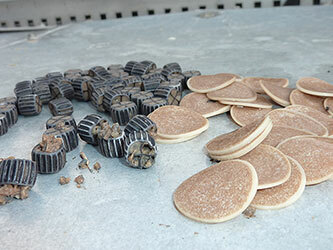 Its application is characterized by extremely high removal rates and reliable process stability. Our BioChips provide removal rates up to 10 times higher than conventional media carriers (in all their various forms). 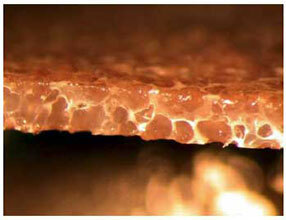 This is achieved through a high-quality pore system as shown under magnification to the right. The MBBR BioChip 30 biofilm carrier is completely free from any phthalates or other plasticizers and does not contain bisphenol A or any other aromatic compounds. It is made of virgin polyethylene (no recycled PE), inorganic fillers, tiny amounts of monoester of glyceric acid (made from coconut fat), citric acid and soda (Na2CO3). The manufacturing process becomes extremely important when used with applications sensitive to additional harmful chemicals such as aquaculture. 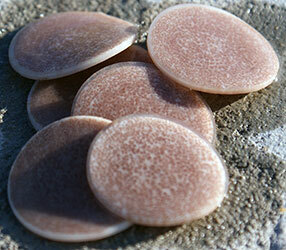 Bishpenol A and phthalates have bene known to cause cancer and have hormonal effects. The parabolic shape of the BioChip 30 allows for a homogenous mixing of the Chips in the tank as well as for the active biofilm being optimally kept in the water flow. Hence, the supply of the microorganisms with substrate and oxygen is ensured at any time and at any load condition. A crucial factor in the Moving Bed Bio Reactor (MBBR) process is the sufficient and frequent contact between the wastewater components and the microorganisms attached to the carrier (biofilm). The necessary mixing of the carrier elements in the reactor (reaction tank) can be achieved using the process air supply required in aerobic treatment processes. 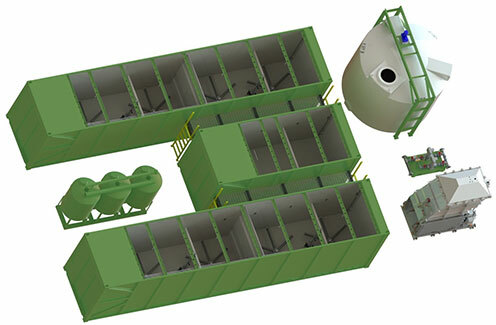 In anaerobic treatment processes, the carriers in the reaction tank can be moved properly by pumping water or by using immersed, slowly-rotating mixers. The characteristics and quality of the biofilm establishing on the carrier surface is not only influenced by shear forces in the tank but also by the composition and the loads of the pollutants in the wastewater (substrate). The more the wastewater is polluted with biodegradable pollutants, the more intense and the faster the growth of biomass. Problems caused by a decrease in biodegradation efficiency are largely a consequence of an intense thickness of the biofilms, resulting in a reduction of the active carrier surface area. The MBBR BioChip 30 does not have this issue. 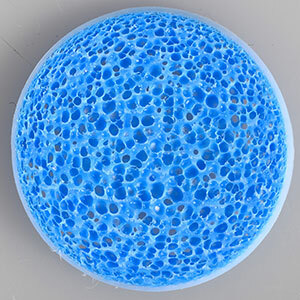 Its process is very different in that the biofilms, which colonize the pores of the BioChip and which try to grow out of the pores, are kept constantly thin by shear forces. These shear forces evolve on the outsides of the carrier elements due to their movement in the water, and provide the self-cleaning effect of the MBBR BioChip 30. Consequently, the biofilms remain thin as they are protected from the shear forces only inside the pores. Thin biofilms are crucial for an optimal supply of the microorganisms with substrates (removable pollutants and nutrients) as well as with the oxygen required for the aerobic biodegradation processes. 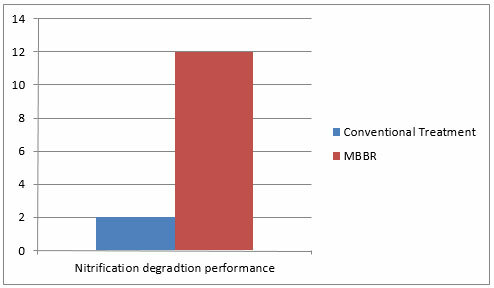 In this way, the MBBR BioChip 30 allows for constantly high biological removal rates and reliable process stability. MBBR BioChip 30 – no clogging due to biofilm only being present inside the BioChip pores. The carrier media has been specifically developed for the biodegradation of carbon and the elimination of nitrogen in industrial as well as in municipal wastewater treatment plants and, due its specific characteristics, can be used equally for aerobic, anaerobic and anoxic processes. The results are extremely high removal rates in denitrification, nitrification and COD elimination process. The MBBR BioChip 30 provides the most stable and reliable process of any comparable carrier media. To illustrate this, we show below its usage in the ANAMMOX process. This is the process that takes place during the biological treatment of wastewater and sewage, ammonium nitrogen (NH4+) and nitrite (NO2-) are being symproportioned to molecular nitrogen under anoxic conditions. 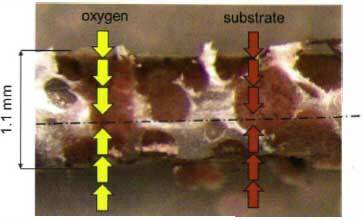 The surface characteristics of the biofilm carrier must ensure the permanent attached growth of the bacteria. 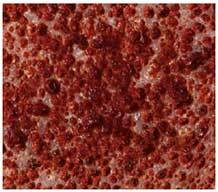 In other words, the biofilm carrier has to provide a porous and micro-rough surface structure which enables the planctomycetes (bacteria) to permanently attach to the carrier surface. Utilizing the MBBR BioChip 30 carrier media planctomycetes can permanently settle in the protected pore structure of thie carrier and are, as a result, prevented from being flushed out of the reaction system. The MBBR BioChip 30 provides for a high space-time-yield by allowing the bacteria to settle in the protected areas of the chip where they can reproduce. This also ensure the substrate can transfer through diffusion into deeper biofilm layers. Due to the material thickness of approx. 1.1 mm of the carrier media, the diffusion depth of approx. 0.5 mm on both sides of the carrier is not being exceeded. 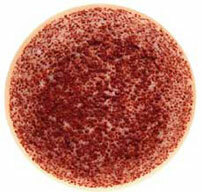 This fully meets the requirements of an optimal habitat in the form of a special pore system having a depth of approx. 0.5 mm on or in the MBBR BioChip 30, respectively. Municipal or domestic sewage treatment plants operate with a high ammonium nitrogen load (NH4-N) coming from their sludge treatment process. This partial flow is usually re-supplied to the biological main flow process where it causes energy consumption due to the process air flow on the one hand and BOD consumption on the other (carbon source required for the de-nitrification process). Under optimal conditions, it is however possible to treat this filtrate flow by means of ANAMMOX process and hence to relieve the treatment plant energetically and hydraulically. The MBBR BioChip 30 offers a price-to-surface area ratio which is more favorable than many other carrier types. To properly evaluate offers for carrier media you need to compare prices of different media not per m3 but per m2 since each media has a different m2/m3 ratio. The protected active surface area (in 2/m3) and not solely the volume (in m3) of carrier media is what is needed to make an accurate cost comparison. The special shape and specific gravity of the colonized MBBR BioChip 30 provide unique motion characteristics which require less agitation energy in the form of process air supply in order to keep the carrier suspended in the wastewater. 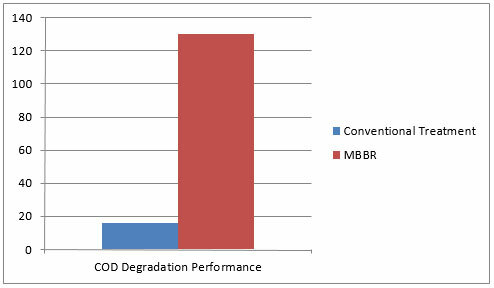 By using the MBBR BioChip 30 Wastewater treatment operators will benefit from significant savings in operational expenditure. Each MBBR BioChip 30 media has a very low mass compared to its size. Consequently, the impulse transferred when contact is made with another carrier element is insignificant thus drastically reducing abrasion and wear. 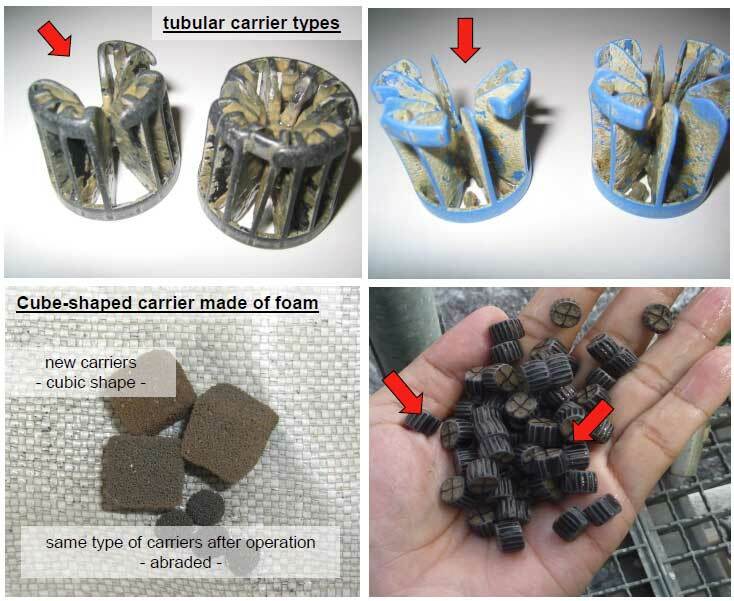 Other tubular carrier types (often injection-molded and heavy related to their size) conversely break after a certain time in operation leaving carrier parts on the water surface in the clarifiers of wastewater treatment plants. Learn more about our MBBR system, access the brochure, models, specs, and more!